ublin is a city in the south-east part of Poland and the capital of Lublin Voivodeship (province). The name Lublin, exactly the same as today which is quite rare, first appeared in chronicles in 1228. Just like „Kraków” comes from the name of Krak, a legendary ruler residing on Wawel Hill, also Lublin comes from a name - Lubomir. In Lublin in Fabryka Samochodów Ciężarowych cars like FSC ‘Żuk’, and later FSC ‘Lublin’ were produced. In 1974 Lublin witnessed a formation of Budka Suflera, one of the most important Polish blues-rock, progressive rock, and later rock and pop bands. It is not quite clear when the band was formed as different dates are given. In Wikipedia Jerzy Janiszewski says that after Janusz Fifowski came back to the position of Lubelski Dom Kultury in 1972 he printed some posters with information about a blues-rock bands called „BUDKA SUFLERA” being a part of LDK's activity. These discrepancies could come from the mistakes made by authors or maybe of the unclear status of the band that at beginning was experiencing lot of member changes. Maybe that is also why the Wikipedia input does not include an information about one of the first drummers that played with the band - Kazimierz Grymuza, who, after a short time, was replaced by Zbigniew Zieliński. At the time Lublin's music environment was particularly active. Bands formed and disbanded rapidly. A member of one of such 'short-term' bands, apart from above mentioned drummer, Kazimierz Grymuza, was a guitar player, Janusz Sikora. He never became a professional musician but had a chance to play, among others, with Henryk Mazurek, the first solo guitar player of another Lublin based band, Bajm Bajm (source: Maciej Skarga, Sikora Turntable – z miłości do winyli, „LAJF – Magazyn Lubelski”, see HERE http://lajf.info/?He never became a professional musician but had a chance to play, among others, with Henryk Mazurek, the first solo guitar player of another Lublin based band, Bajm (source: Maciej Skarga, Sikora Turntable – z miłości do winyli, “LAJF – Magazyn Lubelski”). Mr Sikora did not become a musician. He worked for several different companies and finally, after turning 30, he sold his Fiat 126p, or so called: „Maluch”, and started his own business – he became a locksmith specialized in brass products. Company Allmet has been on the market for over 30 years specializing in metal products. But its not the only thing they do. As Mr Sikora says, the machines, while not working for his main business, allow him to take on his passion - audio. Years ago Mr Sikora was known due to his involvement in Burdjak & Sikora brand manufacturing tube amplifiers, but a few years ago his focus shifted to turntables. His professional experience, knowledge and experience of his workers, as well as an advanced machine park are perfect means for realizing his audio ideas. He does not use CNC machines as these come handy only when large quantities are produced and as we all know high quality audio is rather about small batches and not mass production. His story sounds somewhat familiar. Mr Sikora bought, not so cheap, turntable to indulge his need of high quality sound. It sounded fine but not exactly as Mr Janusz expected it to. So he designed his own deck, used a tonearm he bought and... it sounded better although still not 100% satisfying. But he knew that he was on a right track. Using trial and error method, also learning from other manufacturers he finally arrived at the point when he could proudly present his achievements to the public. For the first public presentation he chose AudioShow in Warsaw. J. Sikora firm was ready to conquer the market. Today Mr Sikora offers two turntable models – Basic and Reference – and two phonostages: Basic and Reference. 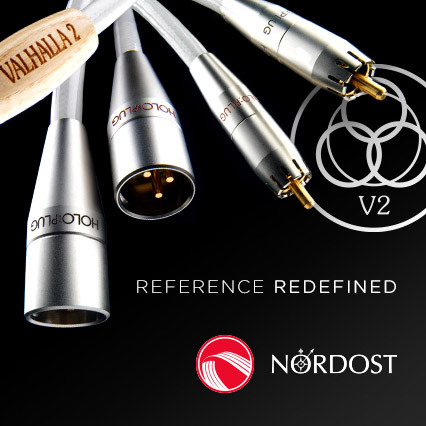 When looking at them what strikes anybody who knows a thing or two about audio is how well made these products are. It's a „boutique” manufacturer (I mean the audio part of the company). Such manufacturers often offer really good sounding products with not so cool, to say the least, aesthetics. The Reference model under review easily matches in terms of its looks, of make and finish best mass-loaders I reviewed including: Transrotor Argos and Kuzma Stabi XL2 among others. Company's paper points out few key elements of this design, but of course having an actual look at the device reveals even more. If you ever saw above mentioned Kuzma Stabi XL you should realize that it clearly inspired Mr Sikora. Being inspired by a product of another designer and developing this inspiration towards a chosen direction is a special sort of tribute paid to this designer. 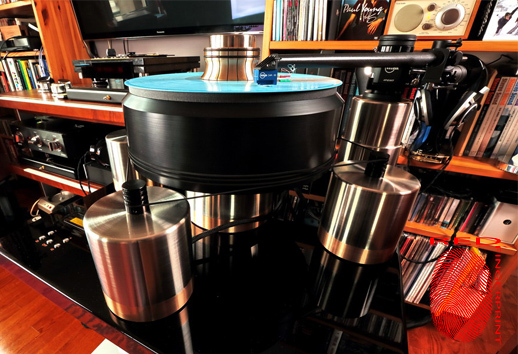 The Reference turntable consists of few main elements such as: a plinth with a main reversed bearing, platter, four motors, an aluminum base with controlling circuit and power supply. 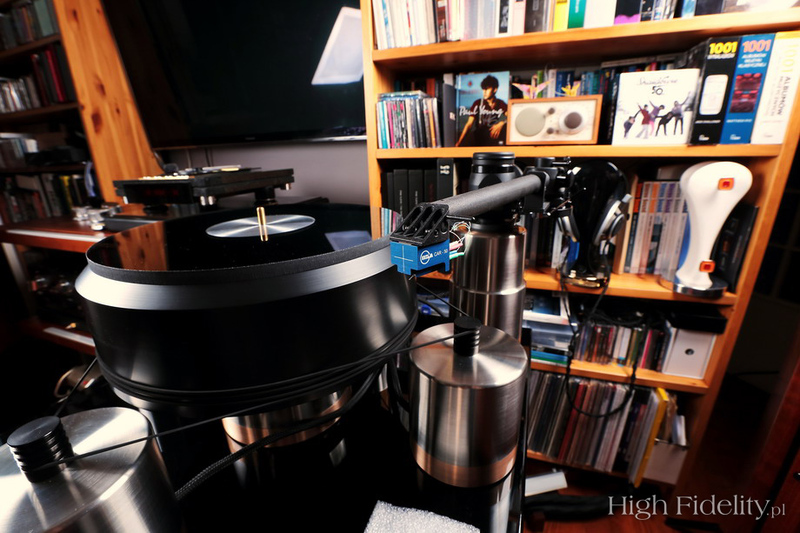 Of course to have a complete setup one needs a tonearm and cartridge too. 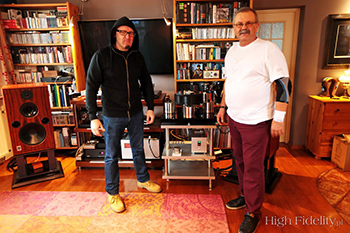 Again, an inspiration with Kuzma's works becomes obvious when one realizes that Mr Sikora delivered his turntable for test with Kuzma 4Point arm – one of Stereophile's Michael Fremer's favorites, but also the first choice of Mr Sikora. He believes that when it comes to tonearms Franc Kuzma is a genius. For this test we received deck together with a special version of 4Point, the 14” one. The CAR-50, MC cartridge with Microridge stylus and 4N silver coil wire came from the same brand. The Kuzma 4Point tonearm is one of the most interesting and the best tonearm money can buy. Its design is similar to uni-pivot but it sports a unique bearing configuration of four points. For increased stability and better resonance control arm features lateral and vertical oil damping. Tube features a conic shape and continuous silver wiring from the pins on one side to the RCA sockets on the other. Interconnect terminated with silver Bullet Plugs by KLE Innovations uses exactly the same silver wire. Arm features also a great VTA adjustment mechanism. The counterweight consists of two elements placed on two pivots. One placed the main one on lower pivot – this one is chosen basing on the weight of the cartridge one intends to use. The actual VTF is set using the second, smaller one that allows precise adjustment. The version we got for the review is the 14'' one and it's probably the first official review the includes this version of the arm. 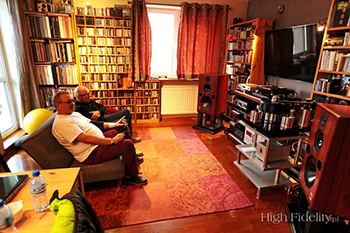 Previously we tested the 11” version together with Kuzma Reference XL2. CAR-50 is the top Kuzma MC cartridge. For its coils manufacturer used 4N silver. It also features a Microridge diamond on a Sapphire cantilever. It delivers an output of 0,3 mV, and offers a 10x10-6cm/dyne compliance. Its body is made of brass and aluminum which makes it relatively heavy. Its regular shape makes setup rather easy. Kuzma cartridges are custom made in Japan – we don't know which manufacturer exactly does the job, but we do know that it is a one with “50 years experience”. Mr Sikora (on the right) and helping us with turntable setup Jerzy „Szela” Stankiewicz – musician (Texasy), DJ and radio journalist. WOJCIECH PACUŁA: How and when did your audio adventure start? 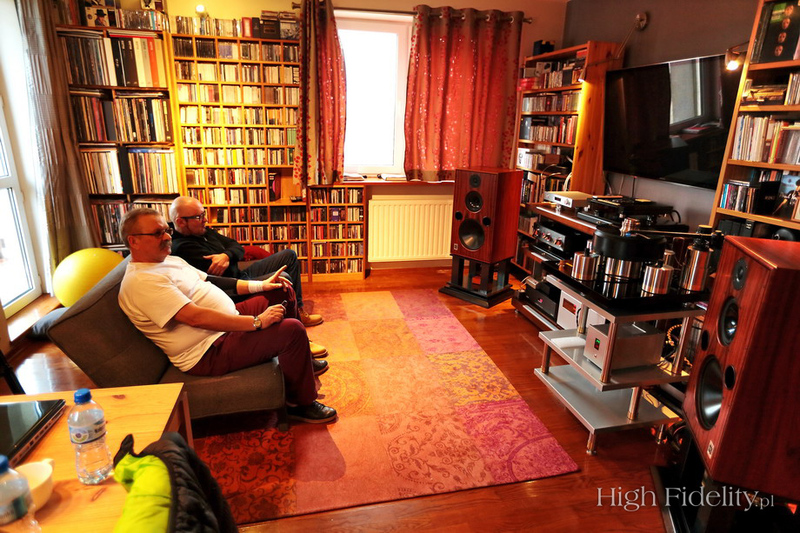 JANUSZ SIKORA: In the times of Technics and Pewex, meaning 1980ties replacing vinyl with CDs was supposed to offer us a better sound quality. Only it didn't. So after many experiments I gave up on digital sound and returned to the black records. The first high performance turntable I bought maybe 10 years ago – boy, was I disappointed! SO I had no choice but to create my own designs. You're also a musician – what was your instrument, when did you play it and what kind of music? Yes, I did play some music. In 1970ties everybody started their own bands. I played guitar, although, unfortunately, I never was a genius player, so after some not so successful years of trying I turned my interest to carting. I was even a member of our national team from 1975 til 1980. In 1980 I decided to give audio another try and with some help I built some tube amplifiers. At first I worked with my own father making stage amplifiers, and later since 1984, together with Olek Burdiak, we build amplifiers under Burdiak&Sikora brand. Your sons also play instruments – which ones and where? Robert and Jakub started a band called Crab Invasion. Jakub is the leader of the band, he plays guitar and composes music for the band. Robert plays bass guitar. Both of them also sing. They played on Open’er Festival, Off Festival, and Męskie granie. In 2013 they released their debut album „Trespass”. Now they are working on material for their second album. Is vinyl your exclusive medium or do you listen to digital music too? For the last 8 years I've been listening to vinyl. I do listen to CD too, in my car. I can't imagine me going back to listening to CDs. Sound delivered by vinyl is so tangible, so real, so natural! I listen to music with my ears and my whole body, not with measurement equipment. I don't care about vinyl shortcomings (that exist according to technicians and engineers who believe only in measurement results). Most turntable I ever reviewed were placed on Finite Elemente Pagode Edition (today this version is called Pagode APS). I ordered my unit with a standard upper shelf and a „heavy duty” lower one, as it accommodates Soulution 710 and power supply for Ayon Audio Spheris III. Lower shelf can carry up to 120kg, while the upper one 'only' 60 kg. I could, of course, order a version with both 'heavy duty' shelves but I didn't want to. 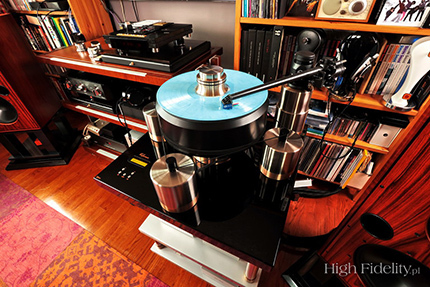 So this particularly heavy turntable had to be placed on Mr Sikora's rack. Shelves are made of high quality aluminum, pillars are made of Inox steel and brass separated with a zirconium ball. Deck was placed on the top shelf and the power supply on the one below. By the way – that's probably the most good looking power supply I've ever seen. I think that if Mr Sikora could make a similar design preamplifier or power amplifier these could be very special and unique. Mr Sikora's rack was placed in exactly the same spot as Transrotor Argos did some time ago, and more recently also Transrotor Zet 3 Infinity. By designer's suggestion I decided to treat this turntable as a system. So I did not replace the tonearm nor cartridge. That's how I carried also other reviews before, such as: TechDAS Air Force One, Air Force Two, Thales TTC-Compact, Kuzma Stabi XL2 and many others. All above mentioned turntables worked with RCM Audio Sensor Prelude IC phonostage and so did the Reference. For comparison I also used Mr Sikora's own Stereo Phono Preamplifier. Both phonostages were used together with Crystal Cable The Absolute Dream power chord.